Thanks to all the players that took part in the first beta test of aircraft carriers. Your feedback, opinions and bug reports have allowed us to find and fix a lot of bugs and improve some mechanics. Of course, balance, balance and balance. By the way, you‘ll be able to try some of these changes on the second stage of the beta test right now. What if you don’t like the new game play? There will be in-game refund options. Premium ships will be convertible their to doubloon values. Researchable ships are going to be converted to credits and free XP. Researchable ships refund will follow the progression logic: if you get rid of Ranger, you will have to do the same for all higher tier CVs as well, like Midway. In addition to global changes, we are working on some relatively small ones. For example, we are planning to add the ability to open all containers at once, add an option that will remove the haze, make the tracer on different maps more distinct and fight against spam of fast commands in the chat. If we talk about new types of battles, the "Arms Race" went very well and we plan to continue working in this direction. But it needs some improvements, for example: to add the ability for completing missions and getting achievements, and at the same time to add more new buffs - fire resistance, buff to cooldown of consumables, improved manoeuvrability and more. Of course, we will have to work on the interface and the overall balance in the mode, but it is highly likely that "Arms Race" will return to the game. By the way, very soon you will be able to try the new “Twilight” battle type for yourself. There you will fight for the twilight fleet using a variety of new very interesting consumables. Available on the Public Test now! We’ve had numerous discussions with players in regards to Surveillance Radar and we’re looking for ways to work on the consumable. One of the tested prototypes is Radar working similarly to detection mechanics. As in, ships that are in the action radius of the Radar, but behind islands can not be detected. This solution, unfortunately, affected the Radar equipped ships simply too much and using the consumable became overly problematic. For example, detecting destroyers on maps with many islands became nigh impossible. SR equipped cruisers that needed to scout would need to leave their cover and become subjected to enemies’ fire. Another idea is in adding a delay to the effect of Surveillance Radar for allies. In this iteration outlines of the ships detected by Radar won't render for allies for X number of seconds. However, all detected targets will immediately appear on the minimap. Importantly, the interaction of the ship that uses the Surveillance Radar and the target that it detects, remains unchanged with no delay being added. Of course, we're also planning balance edits in the near future. Some battleships need our love. 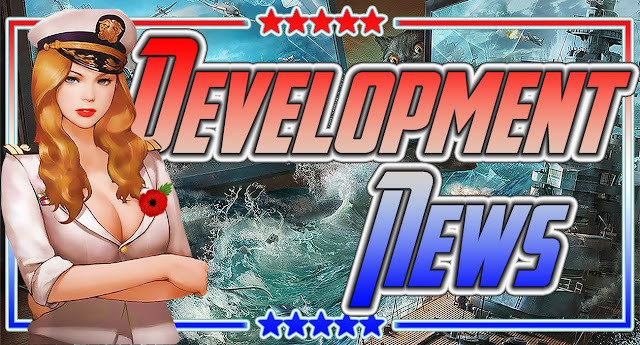 For example, some buffs for researchable American battleships from tier III to tier IX, as well as Myogi, Izumo and Friedrich der Grosse are planned. In addition, we intend to strengthen the plating of the central part of the cruisers. Thus, with skillful manoeuvring, it will bounce part of the Armour-piercing shells of the battleships, thus rewarding the experienced players. We also plan to bring changes to the infamous Inertia Fuse for HE shells, since light cruisers become notably scarier than their heavy brethren, while only sacrificing 4 commander skill points. We would like to try out a more complex approach that would include systematic changes in plating. That, in turn, would allow the gameplay paradigms of light and heavy cruisers to find themselves further away from each other. We’re also working on a rework of flooding mechanics, to make them more flexible and less dependent on luck. Main issue we would like to address is slow and sure destruction of ship, that caught a flooding by accident. Finally, let’s not forget about the plans that, unfortunately, were postponed. "Improvements to Container Barge in the Port"
For example, the improvement of the container barge in the port has not been implemented. This was not the most popular request from players, but still somehow wanted to give players the opportunity to receive additional bonuses. And in end we implemented this in other ways, for example, renewal of the clan base or the addition of "Daily Shipments". So join a clan or create your own and grab some bonuses even if you don’t do clan activities. Extending Clan Battles format up to 8 players. We really wanted to change this format, but judging by the activity of the clans, it is very difficult to gather a team of more than 7 people. Despite the fact that the clan community is growing more and more every season, we did not want to make the threshold of entry even more difficult. Two last features simply couldn’t fit into our schedule – visual improvement of the Tech Tree UI and adding more diverse achievements for various battle activities. But they weren’t just left on the back burner, we hope to eventually make both available!